Millennials get a lot of attention from foodservice operators and chefs, but baby boomers make up a large and lucrative group of potential patrons that shouldn’t be ignored, finds Technomic’s 2018 Generational Consumer Trend Report. 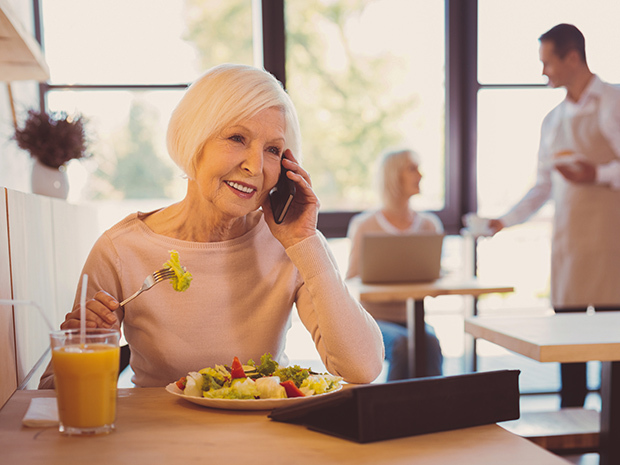 As more senior-living communities cater to the baby boomer set, here’s a look at the factors that drive those customers’ dining choices. There’s a perception that because these consumers are older, they are stuck in their ways. But this generation is the most likely to say that they enjoy trying new flavors from time to time, according to the Technomic report. In fact, 66% of respondents said they like to explore new flavors, especially when added to perennial favorites, such as burgers and chicken. Although Gen Xers are the folks most likely to seek deals and discounts at restaurants, baby boomers come in at a close second. Along with taste and quality, price entices them to visit a restaurant, especially in the quick-service segment. More than other generations, this group of consumers rarely follows restrictive diets such as Atkins and paleo. Instead, they are looking for flexible eating plans that include a variety of better-for-you choices. While few baby boomers are full-time vegetarians, more than 50% say they plan to increase their consumption of fruits and vegetables. Although this generation is pretty tech-savvy and will place online orders from a computer, they are the least likely to order from a mobile device or app. And boomers are not in favor of cashless operations and kiosk ordering at restaurants. Customer service is key, especially in casual dining. Cleanliness matters to this older group of customers, with 63% of boomers saying it is very important in restaurants, especially as it applies to clean bathrooms and utensils. Just as this group takes comfort in trying new flavors via familiar foods, boomers also like to patronize familiar restaurants. Thirty-six percent tend to visit the same few restaurants each time they go out to eat. However, this older generation priortizes food quality and taste more than other age groups—70% say taste is an important menu attribute and 68% value food quality. Older customers are more demanding when it comes to off-premise eating. Order accuracy is essential to 70% of baby boomers, and 75% expect the food quality and taste to be as good as when dining in. Convenience is not as important to this generation as it is to millennials and Gen Zers, according to the Technomic report.